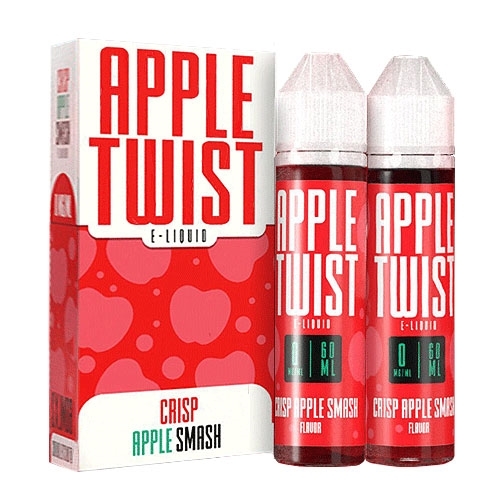 Crisp Apple Smash by Apple Twist E-Liquid is a vibrant new apple juice vape that tastes like fresh pressed apples straight from the orchard. Delight your palate with red delicious goodness you'll want to savor from inhale to glorious exhale and enjoy an invigoratingly sweet and fruity vaping experience with dense, aromatic vapor clouds. Twist E-Liquid is world renown for their award winning ejuice lines and deliver spot on fruit and dessert flavors in all their gourmet premium e-liquids. Twist e juice is available in 120ml and comes packaged with 2 individual 60mL bottles so you can share with a friend. Try it today! One of my favorites now. First time tried.